Structural molding chamber for concrete substrates made of heavy type 130x54mm aluminum profile made of EN AW 6060-T66 alloy - which can be anodized. It creates a chamber of 124x36mm in size, in which laminated or laminated tempered glassboards of up to 38mm in thickness, can be implanted. The profile is embedded into the concrete and stabilized by using specially designed anchors, which are also used for alignment and interconnection. On the top end, the system bears a removable lid, a cap which can be easily removed without using special tools, to keep the inner chamber intact during the injection of concrete into the wooden mold – a process during which the system can be aligned. The glass-boards are tightly secured with rubber gaskets and adhesives, providing stability and easy removal in case of breakage, as well as excellent behavior against alternating temperature changes. It is available in 6m rods which are connected in sequence for a sturdy result, using connecting bars, either straight or angled, which are plugged into the system’s anchoring dents. Designed for the formation of glass railing on balconies or wherever a glass parapet without any visible metal parts is desired. 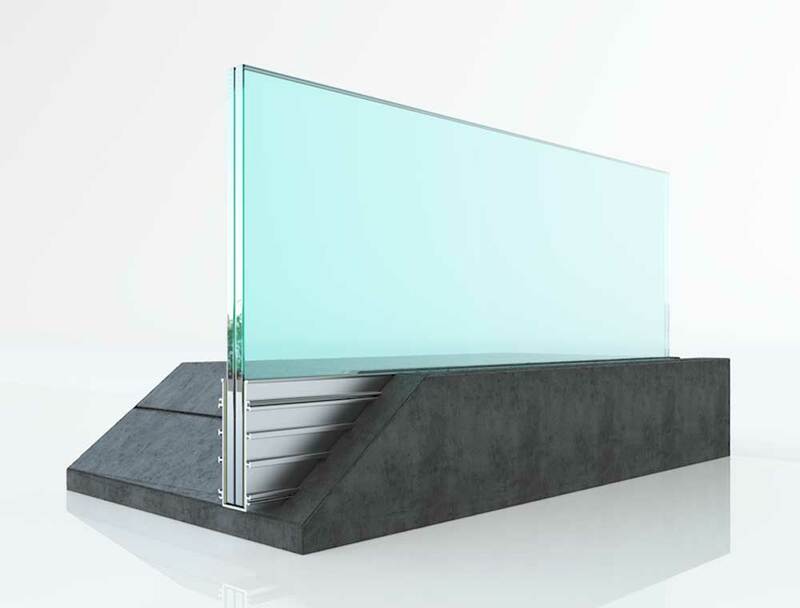 Glass surface maximization: : The implantation chamber is placed into the concrete, avoiding the need for any external mounting, resulting in a uniform glass surface which appears to be sticking out from the floor.